A postcrossing post card from Claus in Hamburg. 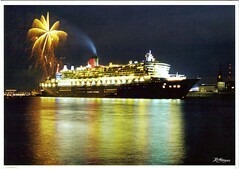 Claus says that when QM2 is in town, people go crazy, and over a million people may watch her. Previous Previous post: On yer bike!